Charles Wisler, portrayed by Rich Henry, is one of the past Galionites who will be featured in the Cemetery Walk on Sunday. Henry said his uncle was a pilot in the US Army Air Core and was killed during a training mission during World War II. He will be wearing Wisler’s actual pilot wings. 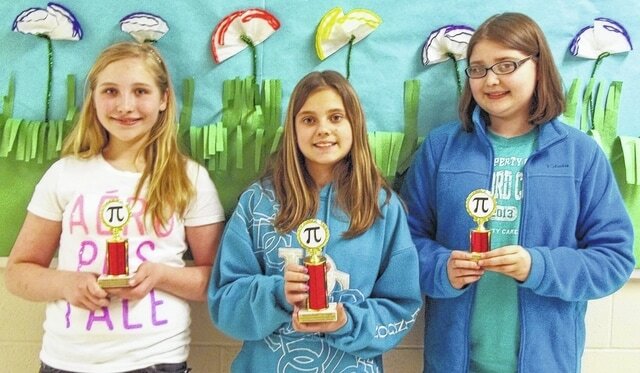 Students in Jackie Fruth’s fifth grade math class competed in the annual Pi Day contest at Bucyrus Elementary School. The top three finishers pictured include, from left, Natalie Stover, Marissa Eulett and Amber Zornes. Fairview Cemetery is hosting a Cemetery Walk 2-4 p.m. on June 14. Galion Historical Society Director Andee Wildenthaler said the event will feature an antique herse, a welcome tent and guided tours. Golf carts and a flat-bed trailer for people who have difficulty walking. This is the fourth year for the event, which is free. “It’s on Flag Day, so veterans and nurses will be honored this year,” she said, adding that six individuals will give presentations at different spots on the tour. In addition, Wildenthaler also said the a public ghost hunt is scheduled for 8 p.m.-midnight June 13 at Brownella Cottage as well as the Historic Grace Church. PI TIME – How many digits of pi do you know? Bucyrus Elementary fifth-grade students celebrated Pi Day this year by memorizing as many numbers of the pi formula as they could. Marissa Eulett memorized the first 151 digits to win the contest. Natalie Stover finished second with 101 digits of pi, while Amber Zornes placed third with 75 digits of pi.